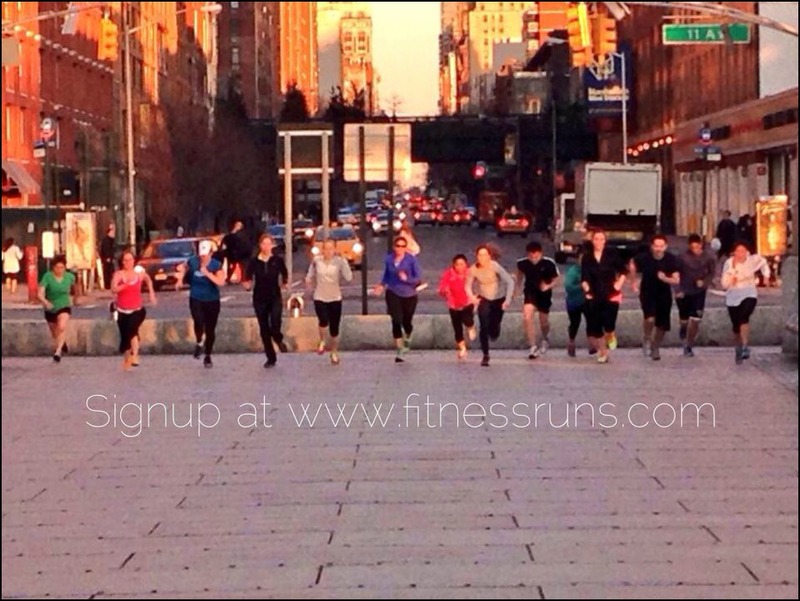 Monday night I went to a free trial class of a new running/ workout class in New York City called FitnessRuns. They offer 30 or 60 minute outdoor classes at parks around the city that incorporate running + strength, drills or yoga. I totally love this concept and I’ve been looking to switch up my workouts a bit recently so I was excited to try it out. We ran from the meeting location down to a park where we did intervals of sprints, strength & cardio drills (squats, mountain climbers, jumping jacks, tricep dips, pushups, etc.) and then ran back to the original location and did a few cool down stretches. That’s me in the middle in blue! I loved this type of workout, but to be honest I think the prices are a bit steep ($15+ for a 30 minute class & $25+ for a 60 minute class), especially considering the classes are held outdoors. On top of that, I actually live on Long Island, not in the city, so I’d have to take the train to the city as well ($15 RT) – that would make each class $30-$45 for me (= not worth it). Right in my neighborhood there are several small parks, plus the local high school with a track that would be perfect for this type of thing! Since I’m not training for anything specific right now I’m going to try to rotate this type of “run” into my workouts and see how it goes! What do you think, would you like this type of workout? Do you have a favorite strength/ cardio drill I should include? I could see you turning this into a group thing near where you live and people can rotate leading the non-running portion with whatever “other thing” they like to do like yoga/pilates/fitness movements that I tend to stay away from. That could be really fun, actually… And a lot cheaper than paying upwards of $50 to get to a class in a park. If I’m not getting AC blasting, I demand a discounted rate! And yeah, I’m sorry but $25+ for a class outside in a park that I doubt they’re even paying for a permit for or anything…way too much. Yes! Let’s get together and do this sometime! I really liked that this had the running incorporated because I felt like it kept my attention better…I tend to lose interest or focus with just the tabata or bootcamp stuff, this broke it up nicely! Hmmm, I ran a track workout tonight and a guy there was doing a whole workout routine – squats, calf raises, planks, etc. I saw him each lap I ran and though – that guy don’t need no gym! Sounds like a cool concept! But I agree. I feel like there is free stuff like this happening all over the city. That does seem pricey considering they don’t have studio rent to pay and that my $25 annual running club membership entitles me to a weekly workout with my team that covers drills like that and running. I actually do workouts like that a lot on a nice day in the park. Burpees are evil but they’ll whip you into shape.